Starting from Apr 1st 2018, DP2000/9000 Series have been discontinued. 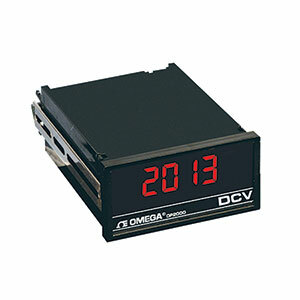 As a possible substitute, please check out the DPPT Panel Meter or DP20 Series for details. The DP2000/9000A and DP2000/9000B are a high-quality ±1999 or ±9999 count DC voltmeter and ammeter, respectively. The base meters are digital indicators for use in electrically-noisy industrial environments. With the addition of analog and control outputs, these meters can provide two-wire currentloop signals to a central control room and provide local alarm or control. A 1/8 DIN case with screw terminals for signal and power is standard. A wide range of options are available. Six types of power supplies are available: 120 Vac, 240 Vac, 24 Vac, 5 Vdc, isolated 9 to 32 Vdc and isolated 26 to 56 Vdc. An LED display is standard, an LCD display is optional and is recommended for viewing in bright ambient light. A NEMA 4 (IP65) splash-proof lens cover is available. Signal input and power connections are made via a rear barrier terminal strip. The motherboard rear edge connector provides access to hold and test, polarity, clock, and the standard analog output and optional analog outputs. Decimal point positions can be selected by jumpers. A 1 mV/count (±2V full-scale) or 0.1 mV/count (±1V fullscale) analog output is standard and is ideal for driving a strip-chart recorder. An additional analog output can be provided by an optional vertical plug-in board. Available output signals are 0 to 5 Vdc, 0 to 10 Vdc, 0 to 1 mA (source or sink) and 4 to 20 mA (source or sink). The top and bottom of each output range can be scaled to fit a user-selected display span. Additional outputs can be provided by a horizontal upper board. Available options include single-setpoint control with one 10 A relay, dual-setpoint control with two 10 A relays, 4 to 20 mA proportional control (source or sink), time-proportional 2 A solid-state relay control, and isolated, parallel BCD output.